Are you ready for some serious bass? 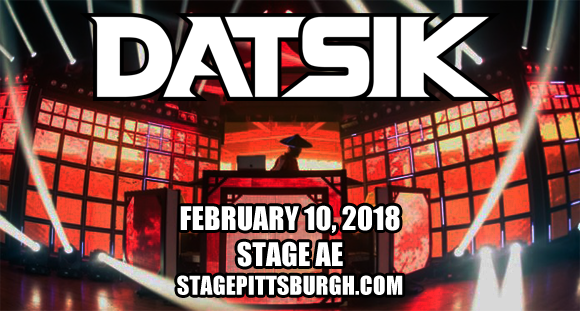 One of the hottest names in dubstep, Canadian mega-DJ Datsik comes to Stage AE on Saturday 10th February 2018 for the party of your life! Embarking on his colossal Ninja Nation Tour, Datsik is pulling out all the stops, armed with his iconic Shogun visual production and face-melting PK-Sound system – you know you're in for a wild ride! Datsik is a Canadian dubstep DJ and producer, who first made waves in the EDM scene in 2009 with the release of several tracks on Beatport, which all reached number one in the Beatport Chart. 2012 saw Datsik founding his own label, named after his 2011 hit record, Firepower, and that same year he released his debut LP, Vitamin D. A year later, he released his second studio album, Let It Burn. Since his debut, Datsik has toured the world, performing at numerous internationally regarded venues and festivals, including: Coachella, Ultra Music Festival, EDC Las Vegas, Stereosonic, Boonstock, Shambhala Music Festival, Electric Zoo and Identity.